H&H Precision pairs with the Orias Chassis. The result: A rifle boasting a ¼-MOA guarantee and exceptional diversity. What does it take to elevate a rifle’s capabilities to an exceptional level of accuracy? High-quality materials fed into top-precision machines operated by heavily experienced technicians? Maybe. But I’d argue that every single firearm brought to market should have all those qualifications. 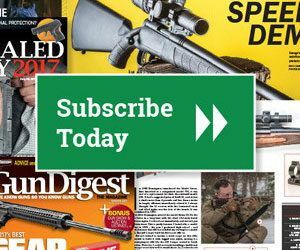 Master the art of long-range marksmanship with Gun Digest Long-Range Shooting. I’m not talking about “minute-of-whitetail” accuracy or a gun capable of ringing a 10-inch steel plate at 600 yards. I’m talking about a level of accuracy that was all but inaccessible — barely even fathomable — to civilian shooters a few years ago. There are a few trends abuzz right now in the shooting world wildly unparalleled in both form and function. On one hand, you’ve got long-standing, well-respected firearms manufacturers that are kicking out sub-$400 rifles capable of producing consistent sub-MOA groups even when operated by riflemen of moderate skillsets. Think Ruger’s American rifles, the Savage Axis, Mossberg’s Patriot and Remington’s Model 783. And there are others. For shooters whose version of success is measured in punched big-game tags as much as tightly perforated paper, these guns — and this entire trending category — is a dream come true both in regard to performance and price. These are the gunsmiths, engineers, machinists and shooters who demand — and are willing to pay for — perfection that’s measured by thousandths of an inch in the shop and by fractions of MOA on the line. Imagine a precision rifle that can produce ¼-MOA groups. Every shot. From every gun that rolls out of that shop. Yeah, that’s freaky. Ken Hagen’s passion for the shooting sports bloomed at very young age and took roots with a family that was heavily involved in outdoor activities. From age 2 and beyond, Hagen was never left behind when his family headed afield. Admittedly, Hagen didn’t do well in grade school because of his daydreams about hunting and shooting while in class. Nothing was more important to him than hunting and shooting, and it wasn’t until he lost his hunting privileges due to poor grades that he found the motivation to start paying a bit more attention in class. Hagen’s grandfather was also a builder, and at age 8, the pair built Hagen’s first high-power rifle together in his shop — a sporterized Springfield .30-06. The stock was honed from an old block of walnut, which was hand-carved and with jade inlays. And that’s the proverbial spark that lit the passion of rifle building for Hagen. Every H&H Precision rifle is built one at a time, from start to finish. Hagen’s attention to detail and devotion to build the best rifle for that customer is solely set aside for that customer, and it’s his one-at-a-time devotion that allows him to do it. With each rifle, Hagen promises himself to build to his best ability and never cut any corners, regardless of timelines and production schedules. Every H&H Precision rifle is tested under video to prove ¼-MOA accuracy with a Target Cam System and two cameras. Each customer gets a video of their rifle shooting the groups. Not only is that unparalleled proof of Ken’s commitment to perfection, it’s almost as if the customer is standing next to Hagen when he’s testing their rife — every shot and every bullet hole develops on the screen and is captured by that video. Even in the current, highly competitive landscape of precision rifle shooters and builders, Ken Hagen’s intuition and gunsmithing experience is largely unparalleled. He’s also equipped with the latest technologies and machine shop equipment and is backed by years of experience to provide a full service operation. The circle of people who know Hagen’s top-secret processes of precision gunsmithing is incredibly tiny, but Hagen accredits much of his success — and his ability to guarantee ¼-MOA — on the Orias Chassis. The Orias Chassis system, developed and built by Killer Innovations and Mega Arms, has quickly evolved into one of the most advanced chassis systems available. Developed around the patent-pending self-adjusting recoil lug alignment system, the Orias Chassis has a free-floating half-round on the backside of the recoil lug that’s held in place by two small magnets. The half-round is free to rotate to perfectly match the angularity of the recoil lug on the receiver as the wedge clamp in the front of the recoil lug forces back into the half-round. This proprietary system eliminates any minute angularity differences between the receiver’s recoil lug and the Orias chassis, which can cause serious accuracy problems at long ranges. The configuration of this system also allows for the removal and re-installation of the receiver with a zero point-of-impact shift when torqued to the proper sequence. The Orias Chassis is cut from a solid block of 7075-T651 aluminum. Although 7075 is nearly twice the cost of 6061 aluminum, it’s roughly 40 percent stronger and notably lighter, creating an incredibly strong yet lightweight platform for precision rifle shooters who appreciate and demand the attention to detail that can set a rifle apart from the crowd. Weighing 2.1 pounds and topped off in a Mil-Spec Type 3 hard-anodized finish, each Orias Chassis is equipped with a removable rear trunnion that accepts an AR-style buttstock. To complete the customizing attributes of the Orias, a quick-detach accessory rail, located over the barrel, is available as an optional accessory. Essentially, with decades of gunsmithing experience from Hagen and hundreds of hours of machining work to perfect the Orias Chassis, comes perfection through time. Hunters, competitive shooters, long-range marksmen, military personnel or law enforcement snipers — there’s a bit of each of these shooting disciplines crafted into each H&H Precision rifle. Rare is the rifle capable of delivering such incredible accuracy while still offering so much diversity. You might even call it freaky.